Is Twitter Excel or Photoshop? Does Twitter need better ways to teach people and help them to think about it the way the current user base thinks about it, or should it create and enable entirely new ways to use Twitter? Does it need better execution or a new approach? I did a 30 minute video chat with the Wall Street Journal on the moment of the Twitter IPO: thoughts on the product and the future. Pretty much everyone has the same common experience when they first use Twitter: bafflement. You go, you sign up, you load the account and... what? Of course, as we know from Nick Bilton's account of the early days of Twitter, this was pretty much how the people making it felt. They knew there was something here - probably - but what? Everyone had a different vision and the company twisted and turned for years (indeed, perhaps if it had been better managed it might not have worked). As it turned out, the blank screen was really a blank canvas. You make your own Twitter. You can build a feed (and follower set) around fashion and makeup, or politics and journalism, or mobile tech (as I have). It's your mirror. This means that that blank screen is perhaps better thought of as an empty development environment - Hypercard, perhaps, or (a metaphor that comes easier to me) an empty spreadsheet. It can be lots of different things, but it's nothing until you start building. This free-form character is quite different from other social networks. Very broadly, these divide into two categories: networks of people you know personally and networks of people interested in the same thing: Facebook or Yelp. Twitter is neither of these. This leads to rather different dynamics for a new user - the 'on-boarding experience'. If you log into Facebook for the first time you don't have to create anything - your friends are already there. You just have to add them. Even more, on mobile social platforms such Whatsapp even this barrier isn't there: the app uses the phone address book to add people automatically, the photo library is shared, push notifications let you know when there's new stuff, and so all of the friction of a desktop social network falls away. The experience comes to you. Equally, on a network of strangers such as Yelp, there's already lots of content from those strangers (restaurants, hotels or whatever), so again, there's no intimidating blank canvas. On Twitter, though, you do need actually to go out and build something. Hence the stories about abandonment rates: people hear about it, create an account, write a few baffled tweets and get no further. What am I supposed to do with this? However, once you're over that hump, Twitter might be much stickier than conventional social networks for actual friends (the Yelp model is rather different). There's not much to keep you on Whatsapp over Kik beyond the nightclub effect - that's where your friends are. But once you've build up a twitter feed around your interests, and a global network of people you've never actually met that you talk to, that's hard to replicate elsewhere. This varies by use case, of course - if you only follow companies and celebrities that's easier to replicate elsewhere than if you've hunted out interesting and low-profile tech execs or makeup artists or experimental musicians, and of course are followed by the same. One of the key challenges for Twitter to carry on growing, and become a truly mass-market platform, is to create things that help people over this hump - which also means mitigating an essential characteristic of the product. The contradiction is that the more that Twitter solves the on-boarding problem, the less sticky it may be. The less manual it is, the easier it is to make something similar. The interesting superset of this 'freeform' question, to me, is what else can be done with all of this data. You made the spreadsheet, so to speak, and 200m people filled it up, and now what do you do? There are two things that occur to me. The second is the contrast with LinkedIn. It seems to me that LinkedIn has (obviously) very rich data about each individual, but very poor data about the links between them. I'm connected to that person, yes, but do I really know them? If I want an introduction, does the intermediate contact know either me or the person I want an intro to, or is it a weak-weak connection? Products like Endorsements and Intro are clearly attempts to change this by gathering better, non-binary data about relationships between individuals, but it's not clear how well they'll work. Conversely, Twitter has very strong data about connections between people, but very weak information about who they are. My Twitter bio is fairly informative, but many aren't, and all lack the richness of a LinkedIn profile. In fact, the only really properly structured data in Twitter is the character of relationships. Hence, LinkedIn can tell me if X works at Yco and what they do there, and that someone I vaguely know has an indeterminate connection to them. Twitter knows that I'm followed by X, and he clicks all my links and retweets half what I say - but there's no way for me to see that and Twitter doesn't necessarily know he's at Yco at all. How to solve that? First, Africa. Mostly Blackberry, mostly South Africa, Nigeria and a little Kenya. Next, a look at South Korea. Android everywhere, but a cluster of iPhone in the centre of big cities. Bombay: mostly Android, but iPhone and Blackberry in the richest areas? New York area - a cluster of Blackberry in the Midtown business district, iPhone in the richer areas (and JFK), Android further out. And western Europe: iPhone and some Blackberry in the UK, Android and some Blackberry in Spain, and Germany and France (as usual) late adopters. Finally, northern and Central Italy.Lots of iPhone, despite the lack of subsidy. Lots more to explore looking at this, but one point stands out. I sometimes feel like Cato saying this over and over, but the iPhone is more expensive than most of the phones on the market, and this shapes the kind of people who buy it. Also, it's worth pointing out that the site that made these is laying iPhone on top of Android rather than blending them. There's Android in the central/rich areas too - though often less. But iPhone is concentrated in those areas. Twitter used to be a protocol - rather like SMTP or IMAP. Other people made Twitter clients, with many different interfaces, and Twitter poked around with metadata (adding retweets, for example), but the user experience was something other people built. Then Twitter pivoted, and deprecated the third party apps, and took control of the interface. The obvious thing that it did with that was to deliver a predictable offer for advertisers. But the more interesting thing to me was that it created a canvas - which is now turning Twitter from a protocol to a platform. Twitter is turning 'Twitter cards' into a platform. You can embed video, or slides, or music - all sorts of things. You can embed a call to action that will harvest the account's email address. And, increasingly, you can drive acquisition - of Spotify users, or apps, or customers. And thanks to retweets these cards can end up anywhere on Twitter, far beyond the original poster's network. Twitter isn't the only company doing this sort of thing. Many of the new crop of social messaging apps, such as Line, Kakao, WeChat and Kik, are also creating canvases of various kinds within their services - within individual messages. Kik and WeChat are exploring HTML5 games within the app itself, and WeChat is playing with retail coupons. Some of the results are pretty strained, but there's obvious value in being able to send tracks, game levels or yelp reviews through such apps, and sending them as rich, actionable cards is much better than a URL string. Cards are an interaction model that are spreading pretty widely, in fact. They're an important part of how Google presents the newish 'entity' based search, which crop up in the right sidebar on the web and of course as part of Google Now. Part of the magic is the semantic understanding of data that lets Google make these automatically, but the presentation is, again, a card. 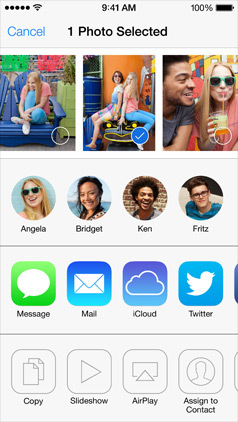 And then there's Airdrop, an intriguing feature in the new iOS7 that's been rather buried by all the fuss about the new visual design. Instant, zero-configuration local sharing (remember Bluetooth?). Apple's screenshots focus on photos, but to developers this is just part of the standard sharing API, and you can put anything in here - coupons, game levels, deep links to reviews or songs. But instead of sending it by SMS or email, you can pass it across a bar top. No canvas, this time (except for pictures themselves), but again the atomised content. What all of these have in common is that they're pulling information out of the app or the service and making it relevant to the moment. They're taking things out of silos, packetising them and making them sharable. But at the same time, they're making them canvases - not just files, but cards, content, real things that you can pass around. In some senses, this started with Facebook, which had a canvas a long time ago (in internet time, at least). Facebook is present on mobile and doing well, claiming close to 800m mobile users, though it isn't close to winning in the sense that it won on the desktop, not with hundreds of millions of Facebook users choosing also to use WhatsApp et al. But Facebook is about aggregation - about sucking everything into the gravitational well and spitting it back out through a black box filter to stop you being swamped. Facebook is an endless stream whereas cards are individual. The point of 'cards', like the story of mobile social, is disaggregation - of the over 200m people who already had Facebook but are using WhatsApp for messages - the 100m Instagram users who prefer it to Facebook for photos, and so on, and so on. From a business point of view, this is interesting because it points to distribution and discovery. How do new products and services get passed around? How does social sharing evolve? Complexity is increased, too - how do you do SEO for Google Now? How should you think about conversion rates on a Kik card or a game shared over Airdrop? There's a sort of inexorability to this: Zawinski's Law states that "Every program attempts to expand until it can read mail." One might now say that every product and service online expands until it can distribute freemium games. I think there's also a question of being native to the platform, though. Chris Dixon wrote recently about finding things that are native to mobile as opposed to mobile versions of desktop products. What could be more native to a smartphone than a piece of content the size and shape of a smartphone screen, that can be sent anywhere?